Kinda funny. 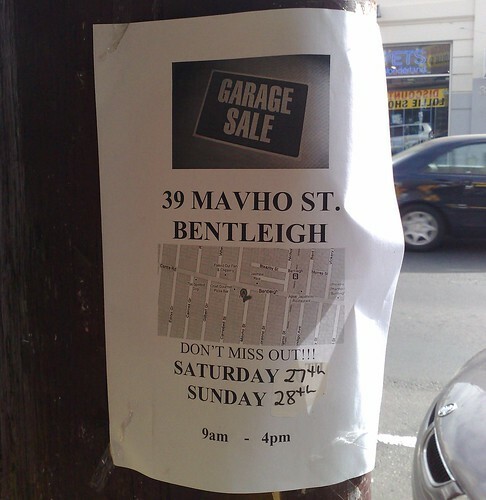 Why just write “Garage sale” in your poster, when you can instead have an image of another “Garage sale” sign? To really spin people out, they could print this picture and stick it up around the place. 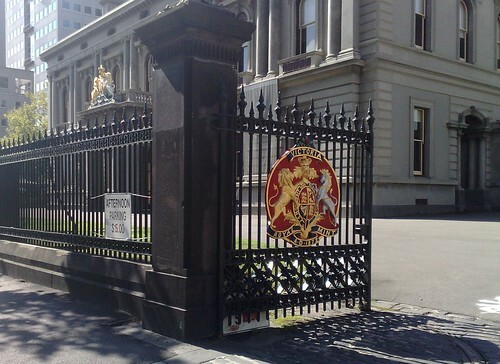 The Royal Mint, Melbourne. Established 1872. Producer of all Australian coins between 1927 and 1967. Noted as one of the finest government buildings of the 19th century, and one of few Australian examples of the Renaissance revival style. So is it just me, or does the “AFTERNOON PARKING $15” sign somehow cheapen it? 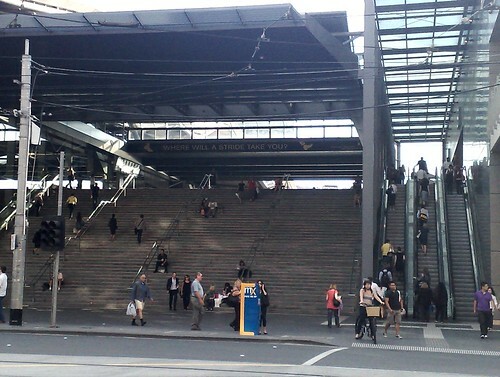 Likewise — it’s a little more subtle, but once you notice it, I think the grand Bourke Street entrance to Southern Cross Station is somehow cheapened by the Johnnie Walker advert across the top. 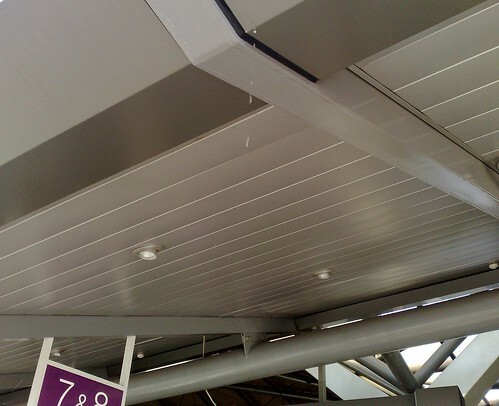 Still, maybe if they raise enough money, they can fix the leak in the roof. 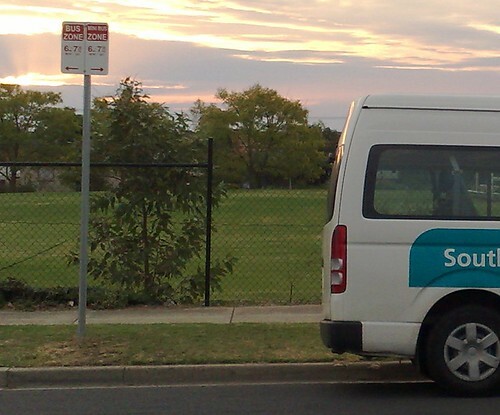 Maybe it’s just me that found this amusing: next to the Bus Zone, something more specific: a Mini Bus Zone. Next → Next post: Why aren’t there more Smartbuses? I find it annoying that many people leave their ‘garage sale’ signs attached to lamp-posts long after the sale is over. I have taken to pulling the signs down myself, and often dump them in the letter-box or front yard of the perpetrators. I know where they live. They should just get rid of the stupid roof – it traps diesel fumes, looks ugly increases carbon emissions due to the need for artificial lighting all day, can’t take a bit of hail, cost too much, and has no purpose other than stroking Bracks’ ego. What I find annoying is all of the “Marxism” rally posters taped to every surface in the CBD. Cheap parking signs have been at the old Mint for a long time and I agree, it cheapens the building and the area. Gotta love that Marxism Jed!! heh, the Marxists must be desperate to find new supporters. They’re not exactly flavour of the month right now. Any wonder, when you actually bother to study what it really is about!! They should never be the flavour of any time!! The Marxists seem to be targeting students. I don’t think that too many older people would would take them seriously.